P Lubana, O Singh, S Gupta, S Odiya, R Mathur. A Rare Case Of A Giant Urethral Calculus. The Internet Journal of Surgery. 2007 Volume 14 Number 2. Introduction: A urinary calculus in the urethra is rarely seen and usually encountered in men with urethral stricture or diverticulum. Herein, we are reporting a rare case of a giant calculus in the anterior urethra of a male patient. Case report: A 39-year-old male presented with acute retention of urine and a hard dull aching mass in the anterior perineum. On examination, a hard mass of 5x4x3cm was palpable in the perineum at the base of the scrotum. X-ray of the pelvis showed a stone in the anterior urethra. Urethrotomy with stone removal was done. The postoperative period was uneventful. Conclusion: A large primary urethral calculus is very rare and may form in the urethra when a urethral stricture or a diverticulum is present. Most of the urinary system stones are located in the upper urinary system. They are uncommon in the urethra (1,2,3), usually get formed proximally and get stuck in urethra or may rarely get formed primarily in urethra (2). Urethral calculi represent less than 1% of all urinary stone disease (3). Giant urethral calculi are even rarer. Most urethral calculi migrate from the urinary bladder. Urethral calculi may get formed primarily in the urethra proximal to a urethral stricture or in a diverticulum. The majority of urethral calculi occur in males (4) and urethral calculus is an extremely rare finding in females (1). 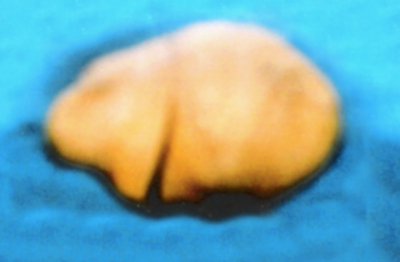 We describe a case of a giant urethral stone, impacted in the urethra of a 39-year-old male. A 39-year-old, otherwise healthy male patient presented to the surgical clinic with acute urinary retention. He had also been complaining of a hard mass in the anterior perineum for the past 8 years. The patient had been having on- and-off history of burning micturition associated with fever for 6 years. Two episodes of hematurea were noted by the patient in the last 10 months. He was apparently alright 8 years back. There was no history of pelvic trauma in the past. On examination, the urinary bladder was distended up to the level of the umblicus. A hard mass of 5x4x3cm was palpable in the anterior perineal region at the base of the scrotum. It was painless, causing mild discomfort only. General physical examination did not reveal any abnormality. Routine metabolic work-up and the renal function tests were normal. Urine culture did not show any growth. Levels of serum parathyroid hormone and serum calcium were within normal range. Digital rectal examination did not detect any abnormality. Plain X-ray of the pelvis showed a large calculus in the anterior urethra. Plain X-ray and ultrasound scans of the kidney, ureter and bladder area were all normal. Urgent surgical removal of the stone was planned because of its large size. Urethro-lithotomy was done. A stone weighing 75g was removed. Chemical analysis of the stone revealed the presence of triple phosphates. Urethral stones are encountered infrequently in urological practice and the studies published in the literature consist of small series and several case reports. Most of the urinary stones are located in the upper urinary system and urethral calculi as such are uncommon (1%) (1,3). Depending upon their site of origin, urethral stones are classified as (a) primary or autochthonous and (b) secondary or migrating (5,6,7). Secondary stones are more common than primary stones and have migrated from higher up in the urinary tract (5,6,7,8). Urethral calculi are usually small (5,6). Giant urethral calculi are rare. The majority of urethral calculi occur in males (4). Urethral calculi may be completely asymptomatic or may be accompanied by one of the following symptoms: perineal or penile pain, frequency, urgency, diminished urinary stream, dribbling, hematuria or/and urethral discharge due to infection. The patient may present with acute retention of urine with insignificant past history. The diagnosis is based on clinical history and relevant investigations (5,6,7,8). Management of urethral calculi varies according to site and size and associated urethral disease. Retrograde manipulation into the urinary bladder followed by litholapaxy or lithotripsy is a suitable procedure for posterior urethral calculi. Anterior urethral calculi can be treated with instillation of 2% lidocaine jelly or ventral meatotomy according to their localization. Giant urethral calculi should be treated with open surgery. 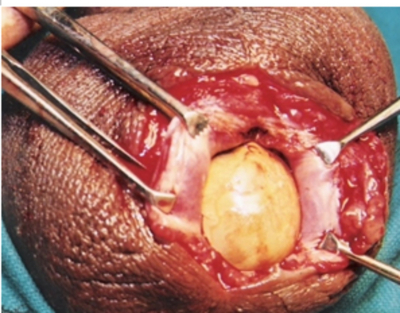 Besides, if the urethra has an associated stricture or has been damaged by prior attempts of extraction, stone removal and urethroplasty are preferable (3). 1. Suzuki Y, Ishigooka M, Hayami S, Nakada T, Mitobe K. A case of primary giant calculus in female urethra. International Journal of Urology and Nephrology 1997; 29: 237-9. 3. Mete KILCILER, Fikret ERDEMIR, Selahattin BEDIR, Hidayet ÇOBAN, Koray ERTEN, Yasar ÖZGÖK. Gülhane Askeri Tip Akademisi Üroloji Anabilim Dali, ANKARA - THE CLINICAL EXPERIENCE WITH URETHRAL STONES AND REVIEW OF THE LITERATURE. 5. Deodhar SD, Khope SS. 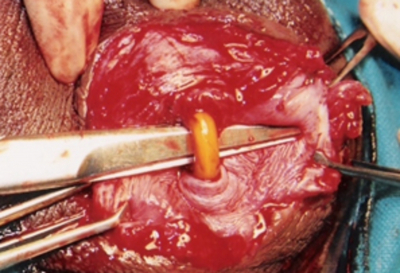 Giant prostatic urethral calculus (A case report). J Postgrad Med 1983;29:49-50. 6. Drach, G. W.: In "Campbell's Urology", Vol. 1, Editors: Harrison, J. H., Gittes, R. F., Perlmutter, A. D., Stamey, T. A. and Walsh, P. C., W. B. Saunders Company, Philadelphia, London and Toronto, 1978 pp. 859-860. 7. Lowsley, O. S. and Kirwin, J. J.: "Clinical Urology" 3rd Edition. Vol. 1, Williams and Wilkins Company, Baltimore, 1956, pp. 317-319. 8. Fletcher, H. C.: "Essentials of Urology." 4th Edition, Williams and Wilkins Company, Baltimore, 1961, pp. 449.